How Much Reward Can An Individual Earn With SMSCHAIN? 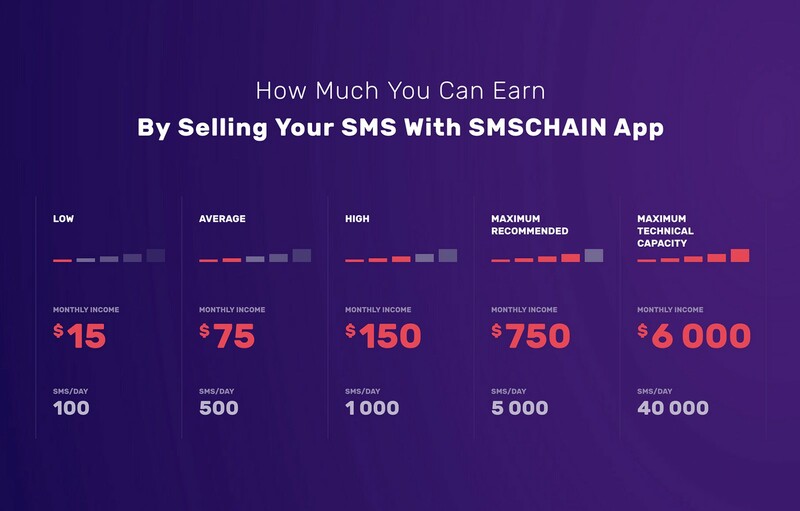 One major attraction of the SMSCHAIN platform is the opportunity for regular users to earn substantial revenue by exchanging their unused text messages for financial rewards. This is a service that feels like discovering a goldmine in one’s own backyard. Apparently, what SMSCHAIN tells the community is that there is a lot of wealth locked up somewhere close that is yet untapped. The primary service of SMSCHAIN lies in using the blockchain to deliver automated text messages by allowing transactions with its native protocol SMSTO tokens on the platform. Purchasing these SMS bundles from their original owners is another major aspect that delivers value and completes the operational cycle. The reward system on the SMSCHAIN platform is designed in such a way that individual miners will be automatically rewarded for each SMS transaction processed at the rate of 0.004$-0.015$ per SMS, depending on the market price. The unit will have full control over the amount and type of messages transmitted via their device. Depending on the miners and the capacity of SMS messages per device, the earning abilities will vary. Hence, for every 100 SMS sent per day on a given device, about $15 is earned per month. This volume can rise up to 40,000 SMS per day, which could earn the user around $6000 at the end of the month. Some of the factors that can affect and influence the reward level of a user hover around the particular location and average cost of service in such areas. To that effect, there are some extreme cases in countries where SMS prices are very low, such as India, which has an average price per SMS of $0.0012. In such countries, the SMSCHAIN will not be profitable for miners or SMS aggregators. But for other regions such as Europe, Africa, Asia, Middle East, Russia and CIS, South and North America, SMS prices are higher and makes for profitable opportunities. But the average market prices for SMSCHAIN services will stay in the range of $0.005-$0.015 per SMS message. Tokens will accumulate in the accounts of miners which have delivered the necessary SMS transactions to the subscribers. These tokens can also be kept inside the blockchain or withdrawn via exchange. Miners receive financial rewards upon the execution and fulfilment of messaging agreements stipulated by auction contracts. Most importantly, miners get paid only after delivering SMS messages from their app. Another major set of players in the SMSCHAIN ecosystem that guarantee the routing and proper delivery of SMS are referred to as Nodes. The Nodes maintain the operationality of the network. In exchange, the Node receives a commission for each successful transaction through an already determined process with respect to the executions by the units. In essence, the SMSCHAIN ecosystem offers an organised market where different classes of participants can function effectively based on their individual capacities to operate. Also, the financial reward system is open for the various levels of reward based on work done and service provided. Such is the beauty of decentralization.